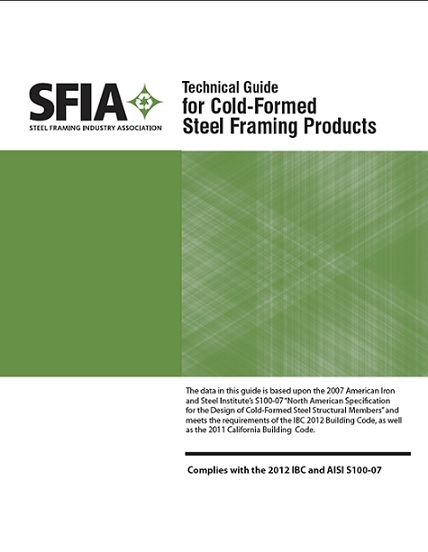 The SFIA “Technical Guide for Cold‐Formed Steel Framing Products,” provides with a comprehensive tool for designing with cold‐formed steel framing members. The 97‐page book covers both structural and non‐structural applications, including section properties of SFIA member product profiles, and complete load and span tables for most applications. In addition, the 2017 SFIA Technical Guide now includes suggested specifications that provide critical information on materials and installation standards to help ensure more accurate bids, safer design, and efficient installation. The data in this guide is based upon the 2012 American Iron and Steel Institute’s S100-12 “North American Specification for the Design of Cold-Formed Steel Structural Members” and meets the requirements of the IBC 2015 Building Code, as well as the 2016 California Building Code and 2014 Florida Building Code. SUMMARY: This Technical Note addresses cold-formed steel studs in nonstructural interior wall systems, often referred to as drywall partitions. The intent is limited to discussion of criteria necessary to understand and determine maximum allowable or “limiting” heights including applicable standards as referenced in the 2015 International Building Code (IBC) for steel framing materials, fasteners, bridging or bracing, and deflection. Examples are provided at the end of the paper to demonstrate selection of studs based on limiting height.